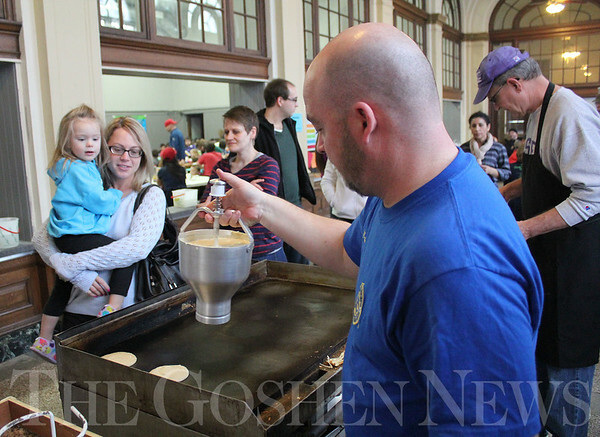 Natalie Yoder, 2, of Goshen, has her eyes on Travis Miller of the Exchange Club of Elkhart County as he drops pancake batter on a grill at The Post Saturday. Natalie's mother, McKenzie Yoder, is holding her. Club members cooked up the pancakes for the annual fundraiser for the faith-based organization that provides activities for Goshen youth at The Post. More than 700 people were expected to donate $5 each to eat all the pancakes they wanted.